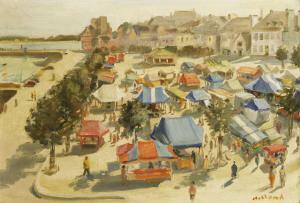 Find artworks, auction results, sale prices and pictures of George Herbert Buckingham Holland at auctions worldwide. 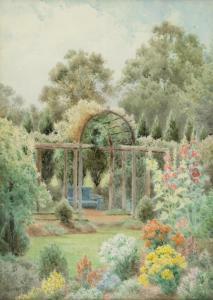 Description: Herbert George (British) 'The Pergola at The Chantry', signed, pencil inscription verso, watercolour, framed and glazed, picture size: 35.5cm x 25.5cm, frame size: 58cm x 49cm. Provenance: part of The Stephen Furniss Collection of Paintings relating to Shere and The Surrey Hills. These pictures were collected during Stephen's time as a self-employed antiques dealer, trading from an Antique Centre in Shere between 1982 and 2000. 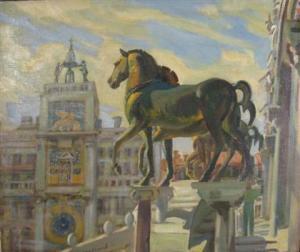 "THE BRONZE HORSES OF ST. MARKS, VENICE"
Overall light surface grime. Light restoration at left of belltower and several small points on tower itself. Otherwise very goodcondition. The surgeon, Mr Samuel Saxon Barton (1890-1957) was an obstetricianand gynaecologist, and a Fellow of The Royal College of Physiciansand Surgeons, Glasgow. He worked in the hospital at Llandudno andhis practice incorporated Bangor Hospital and other cottagehospitals in North Wales. 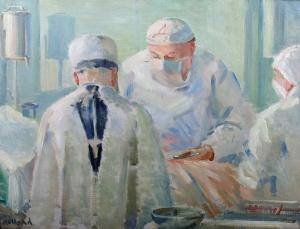 We understand that the location shownhere is The War Memorial Hospital, Blaenau Festiniog and thepainting dates from the later 1930's or '40's. Provenance: gift from Mr Saxon Barton to the family of the presentowner, thence by descent. 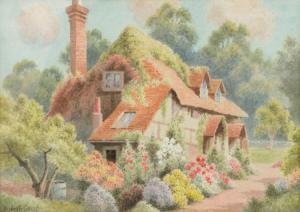 Description: Herbert George (British), 'A Surrey Cottage', signed, watercolour, framed and glazed, picture size: 25cm x 35.5cm, frame size: 40.5cm x 50cm. Provenance: part of The Stephen Furniss Collection of Pictures relating to Shere and The Surrey Hills. These pictures were collected during Stephen's time as a self-employed antiques dealer, trading from an Antique Centre in Shere between 1982 and 2000.